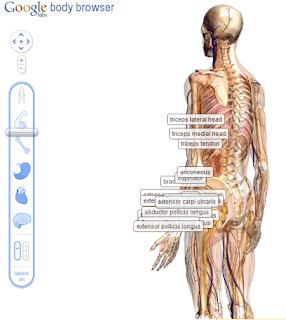 Body Browser: Think Google Earth for the Human Body! Yesterday Google released Body Browser. Think Google Earth for human anatomy. Body Browser is described as a 3-dimensional multi-layered anatomical model of the human body that you can rotate, zoom in on, and search. More information about Body Browser is available in Google Labs. Great to see Google developing this new tool that should be useful for educators, physicians, and others in the health care field. I can't wait to show this new tool to my kids. Thanks to Brian Klepper over at Care and Cost for blogging about this new Google health tool. Today's Charleston Gazette features an article on a new health care demonstration project, West Virginia Connect, funded by a $36 million federal Health Resources and Services Administration (HRSA) grant. The article indicates that the funding will be for eight West Virginia primary care clinics to provide preventative care services to eligible health consumers for a flat $35 per month. The services will include unlimited doctor visits, immunizations and screenings, chronic disease management, and minor surgical procedures. To be eligible to particpate a person must have a job, be between 19 and 64, and make less than $43,320 for a single person or $88,200 for a family of four. In return, participants have to let the state fold their medical data - blood pressure, blood sugar, etc. - into an anonymous 10,000-person database the state plans to use to make more informed choices as health-care reform unfolds. help the health system get ready for 2014, when hundreds of thousands will be newly insured through federal reform. This is the first I have heard about this demonstration project. Other than this Grantee Project Abstract at HRSA website, I was unable to find any additional information or links about the demonstration project online. The article indicates that the project is currently governed by a steering committee of the DHHR secretary, insurance commissioner, and director of the GO HELP office. This past week the West Virginia Public Employees Insurance Agency (PEIA) announced a creative and proactive health initiative to improve the health of West Virginians and move toward keeping future health care costs down for state and public school employees and ultimately for West Virginia taxpayer. Charleston Gazette's Phil Kabler reports on the initiative in "PEIA insurees can offset premiums increase." Undergo a four-step wellness screening to measure waist circumference, total cholesterol, blood pressure, and blood glucose. Completion of the screening provides a $10-a-month premium discount. Submit an affidavit verifying they have filed an advanced directive for end-of-life care, sometimes called a "living will." That provides an additional $4-a-month discount. Wonderful to see West Virginia, often more known nationally for unhealthy news, taking a proactive approach to improving West Virginians health by promoting a wellness activity and encouraging end of life care planning. Both initiatives will help to curb the long term impact on our state's health care cost problems and help West Virginia's become more active in understanding and managing their (un)healthy problems. The West Virginia Health Information Network (WVHIN), West Virginia's health information exchange, has issued proposed privacy and security policies and is seeking public comments on the proposed policies from December 3, 2010 through January 3, 2011. The WVHIN is a public/private partnership created in 2006 under W.Va. Code 16-29G-1 et seq. and is charged with building a secure electronic health information system for the exchange of patient data among physicians, hospitals, diagnostic laboratories, other care providers, and other stakeholders. “We have established a public comment period for the draft policies and would like to invite any member of the public to comments on these policies. Thus, we would like to request your assistance in forwarding this e-mail to any parties you may feel would like to comment on the policies. We welcome all feedback”, according to Business Development Manager Samantha Stamper. Written comments on the proposed privacy and security policies may be submitted to Samantha Stamper, Business Development Manager by January 3, 2011 at sstamper@wvhin.org.